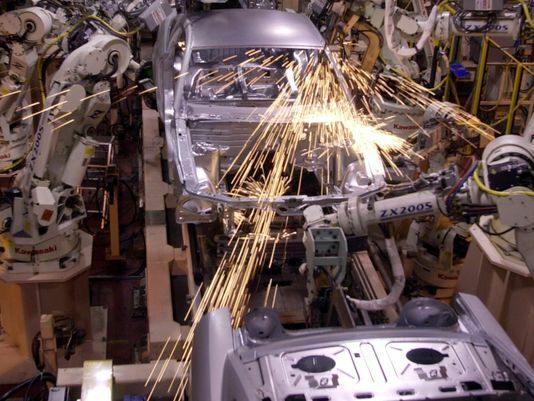 Today, the Boston Consulting Group released a report stating that cheaper, better robots will be replacing factory workers at a record speed over the next decade. The Group predicts that investments in industrial robots will grow during this time at a rate of 10 percent per year in each of the world’s 25 biggest manufacturer nations, which is up from a 2-3 percent rate now. The reason??? Well, high-tech robots are becoming cheaper each year as technology continues to evolve. The exact opposite, of course, is happening in regards to workers. According to the report, by 2025, the implementation of technology will help to cut labor costs by 33 percent in South Korea, 25 percent in Japan, 24 percent in Canada, and 22 percent in the United States. Automakers, of course, are at the top of the list for industries most impacted by the transition. In fact, just last year, automakers shattered all-time records for robotic orders as plants have become more and more unmanned. “The total value of robots ordered in the quarter rose 17 percent to $450 million.” That is a lot of robots! Industry insiders indicate that the use of technology is just a part of the natural evolution of the business as it helps to open up floor space, save money, and increase production line flexibility. All of that may be true, but it doesn’t change the fact that thousands of workers will be left without a job, forcing them to pursue other ventures. For die hard auto lovers and generational employees, that isn’t exactly the best of news. This entry was posted in Culture and tagged factory, robot. Bookmark the permalink.